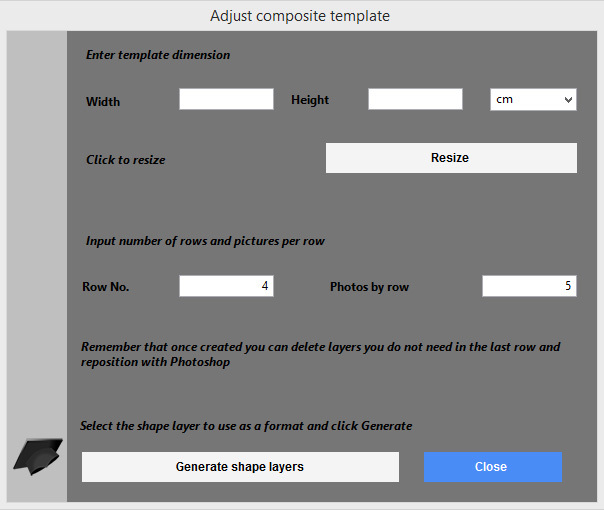 Open a composite template in Photoshop or create a new document and draw a shape layer using Photoshop’s shapes (rectangle) tool and their variations like rounded rectangle, ellipse, polygon or custom shape; in this sample I will use the rounded rectangle tool with a 50 pixels radio. I will add now a stroke and a shadow to this shape. Input the number of rows and cols of pictures you want to have in the composite, if the number is not directly divisible just select the next larger or if you want a different distribution ( for sample 4 x 5 = 20 for a 18 pictures composite). 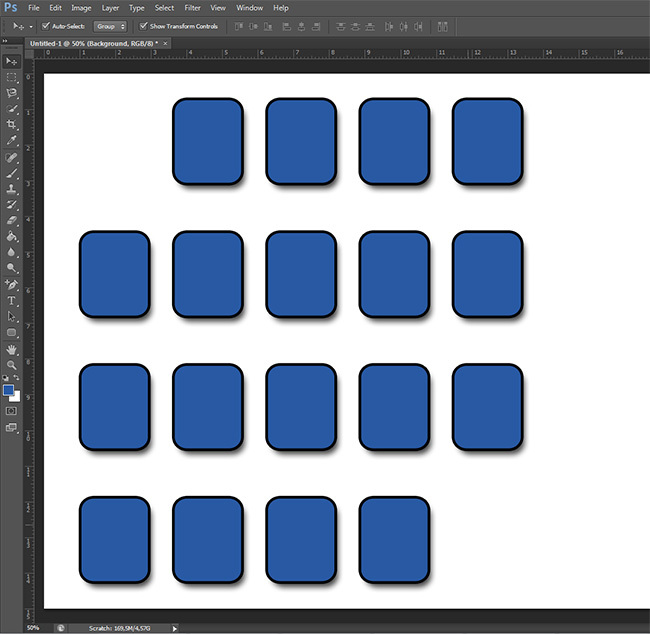 Click at Generate shape layers, this will create copies of the first shape layer for your cols and rows. 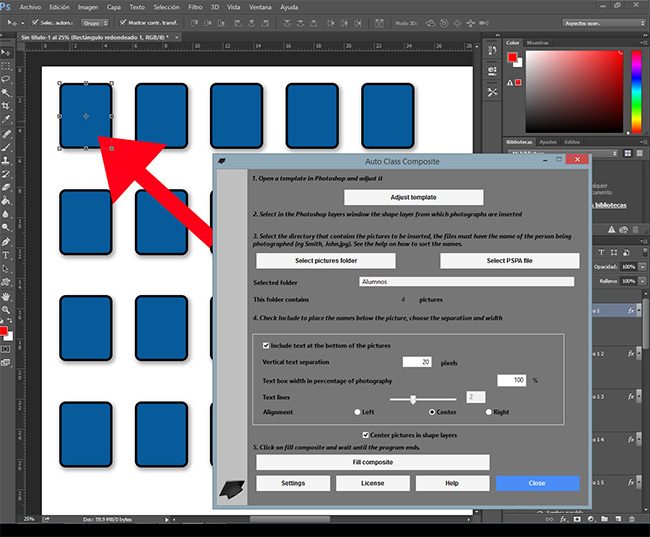 If the shape layers are to large or out of the document just select all of them and using the Move tool resizes them all at once. 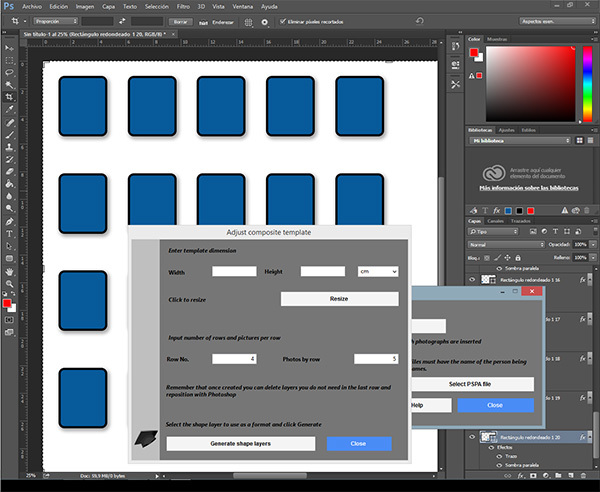 Once finished delete the shape layers you don’t want to use, in our sample for 18 pictures you need to delete 2 shape layers. 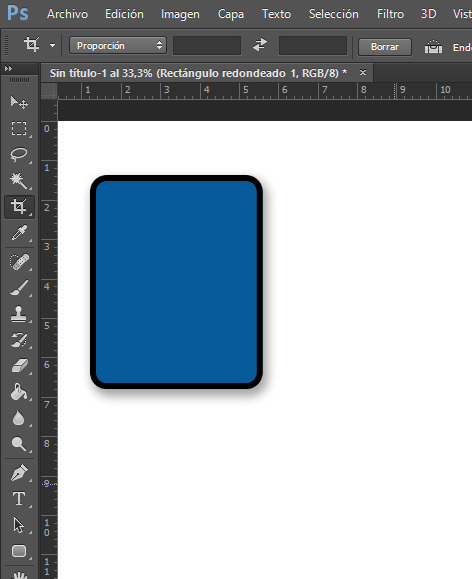 You may realign the shape layers using Photoshop Move tool, the shape layer can be in any location in the open document. 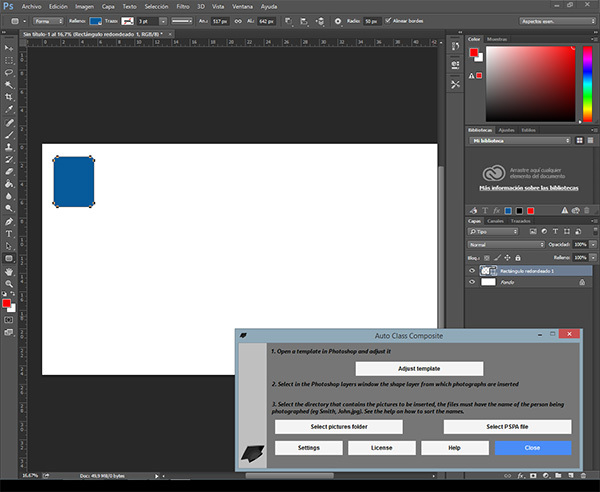 Select in Photoshop’s layers palette the first shape layer from which you want to start filling the composite. Notice that you may fill first teachers and later students by just selecting the appropiate first layer. 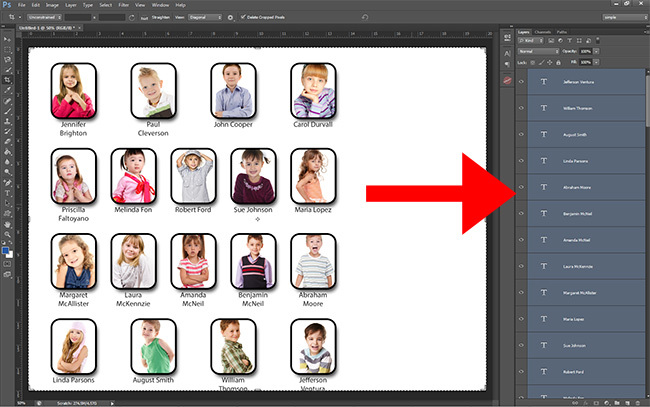 At Auto Class Composite click at the Select pictures folder button and select the folder with your pictures. 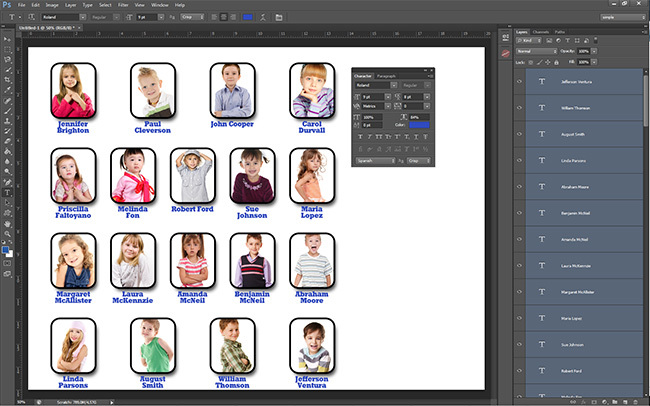 Auto Class Composite will fill the composite and place the names automatically. Once the process has finished you may easily select the all text layers together ( from the top positions in the layers palette) and change the font, the color and all paragraph settings for your texts. 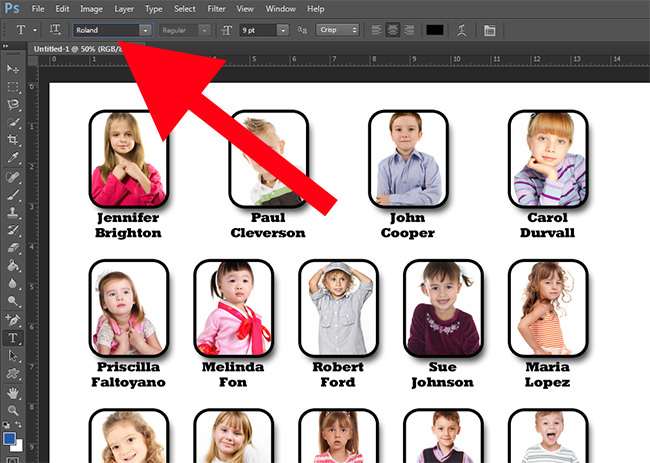 Auto Class Composite sorts the names using the last name and name combination and will place the pictures using this order. You may also just name the files with name and last name like Susan Brighton.jpg, in this case the files will be sorted using name + last name. If you need a special sorting you may add _999_ to the beginning of the file name, being 999 a 3 digits number used for the sorting like _025_Susan Brighton.jpg , of course the special characters will not be printed in the composite.